Bloomsbury USA Childrens, 9781681193144, 24pp. A perfect story for Easter and springtime, this delightful read-aloud also features ten lift-the-flaps! We're going on an egg hunt. We're going to find them all. Join a family of bunnies as they set off on an exciting lift-the-flap Easter egg hunt. There are ten eggs to find and count--but watch out for the obstacles along the way . . . Lambs, chicks, bees, and ducks await, and there's even a wolfish surprise, so be careful! Laura Hughes is a young London-based illustrator. Originally from Bath, she studied illustration at Kingston University and, since graduating, she has created artwork for children's books, cards, stationery and home goods. 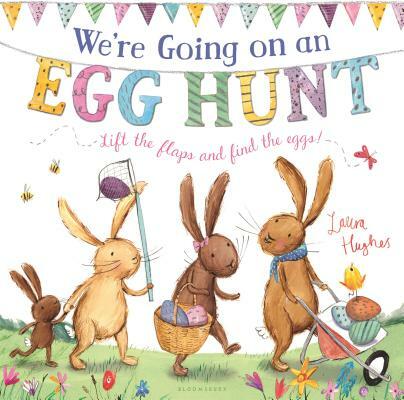 We're Going on an Egg Hunt is Laura's first book for Bloomsbury.